Cumbria’s Police and Crime Commissioner Peter McCall joined staff, dignitaries and others at an event held on 8 February to celebrate Carlisle Mencap’s 50th anniversary. The event aimed to raise awareness of the work of the charity throughout Cumbria. A major theme for the charity is to not only celebrate its own history but to make the mainstream local community aware of the rich history it has. For many years the history of people with learning disability has been overlooked or not regarded .This visit was an important part in bringing the story of Carlisle Mencap home to the wider community. Part of the event included a tour of the ‘Independence Studio’ – an art and film making project for people with learning disability. The group specialise in making educational films to a high standard, and are currently working on a project on ‘Mate Crime’ funded by Cumbria’s Police and Crime Commissioner, Peter McCall. Mate Crime is when people pretend to make friendship with people with disability so they can either exploit them financially or sexually. 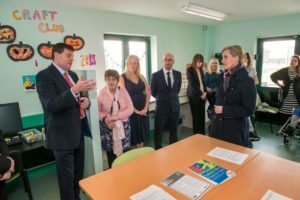 Speaking of the visit, Peter McCall said: “I was really keen to support Carlisle Mencap on this project, as they do such vital work in our community to raise awareness of issues like Mate Crime. This is one of the cruellest forms of hate crime and one which people with learning disabilities are particularly vulnerable to. We want people to know how to avoid being caught up in it and how to report it, and this film will help do that. Sheila Gregory, Chief Executive of Carlisle Mencap said: “We are very excited about the visit as it puts Carlisle Mencap on the map. Over 50 years people with learning disabilities have faced many challenges, today many challenges come about because people with learning disability are more free to access the community.